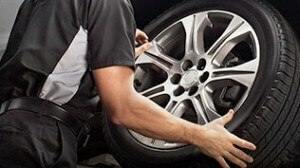 Markville Chevrolet’s GM Certified Service Center has the experienced tire technicians to perform fast, accurate, wheel alignments. Why does my vehicle need wheel alignments? The justification for getting regular wheel alignments is two-fold. Alignments will not only save you money on tires and fuel, but will also help keep you and others on the road safe from a catastrophic tire blowout. Your tires are an investment. If your wheels are misaligned they will wear unevenly, which could cause pulling, vibration, and eventually put you at risk of experiencing tire failure while on the road. If you notice your tires are wearing unevenly, or notice symptoms of uneven wear described above, schedule a wheel alignment with your GM Certified Service Center as soon as possible. While tires and wheels are aligned and balanced at the factory, natural use of your vehicle over time will cause gradual changes to your vehicle’s frame resulting in slight to severe wheel misalignment. Wheel alignments should be performed at least once a year to counteract these changes. In certain circumstances including collisions, maintenance to the suspension system, or installation of new tires, a wheel alignment should be performed during the same service center visit. If wheels are allowed to become exceptionally misaligned, damage can occur to the bearings, shocks, or other suspension system components. Markville Chevrolet’s state-of-the-art equipment and years of experience mean we can perform wheel alignments expertly and quickly—saving time and money for our dealership and our customers. You can feel secure that you are getting quality service for the lowest price possible. Markville Chevrolet also runs seasonal specials. Check here to see any current deals on wheel alignments. If you don’t see an advertised alignment discount, be sure to ask a tech when our next discounted alignment deals are running. What does camber and caster mean? When you bring your vehicle in for an alignment, you will hear your technician talk about the camber or caster of your tires. These are terms describing the comparative angle of your wheels from the frame of your vehicle. 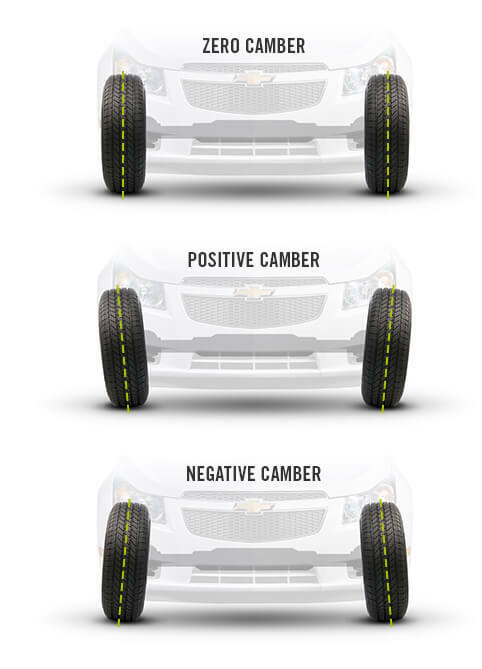 Camber describes the vertical tilt of your tires when viewed from the front of the vehicle. Ideally, your tires are aligned exactly perpendicular to your car’s frame. Sometimes, however, there is positive or negative camber, meaning that the wheels tilt inward at the top or bottom. Positive camber can cause premature tire wear along the outside of your tires, and negative camber does the same to the inside of your tires. Both cause stress to suspension parts. If positive or negative camber is unequal between sides of the vehicle, your vehicle will pull or lead to the side with the more positive camber. Caster is the forward or rearward tilt of the uppermost point of the steering axis from a perfectly vertical line, when viewed from the side of the vehicle. A backward tilt is positive and a forward tilt is negative. Caster affects how much directional control you have when steering. Proper caster is determined by vehicle height, which is one of the reasons reputable auto shops recommend you keep vehicles at the height they were designed for. Overloading your vehicle, or weak rear springs are a few things that can negatively impact proper caster. If the back of a vehicle is lower or higher than its designated trim height, it will thrown the front end of the vehicle into a more or less positive or caster than what is ideal. If a vehicle’s caster isn’t positive enough, steering will be touchy at certain speeds and it may be difficult to return wheels to a neutral position when completing a turn. If opposing wheels aren’t at the same caster, the wheel with more positive caster will pull toward the center of your vehicle, and your vehicle will pull to the side with the least positive caster. Toe is used in front-end alignments and describes the angle inward or outward of the front wheels. If you have any questions or would like to schedule your alignment, book an appointment with our GM Certified Service Center today!